Guatemala Police Archive Yields Clues to 'Dirty War' Human-rights researchers are sifting through tens of millions of documents, searching for evidence of the Guatemalan police's role in murders and disappearances during the country's "dirty war" in the 1970s and 1980s. 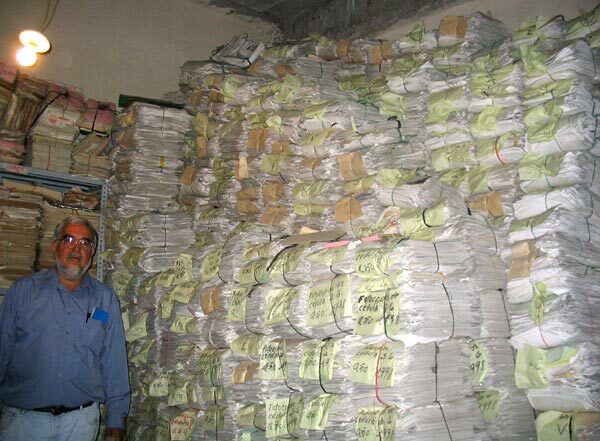 Alberto Fuentes, an official with the Guatemalan Office of Human Rights Ombudsman, stands with some of the estimated 80 million documents of the National Police Archive. "The dimension of the archive is truly gigantic," he says. Scroll down to read John Burnett's Reporter's Notebook about covering Guatemala's civil war in the 1980s. 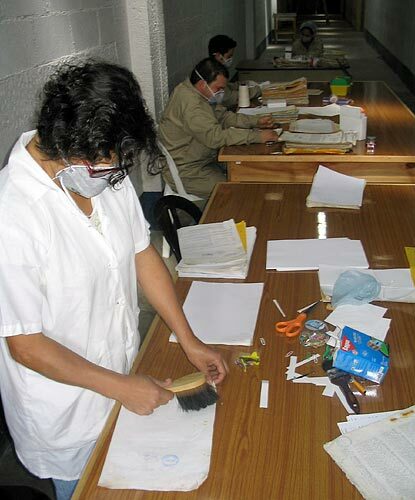 Workers clean documents in the Police Archive, preparing the records for analysis by human rights researchers. 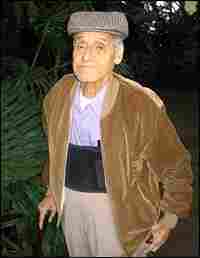 Retired Gen. German Chupina Barahona, 85, former director of the National Police, at his home south of Guatemala City. He is accused of presiding over a department that committed human rights abuses against suspected insurgents. But he says, "Fortunately, nothing grave happened on my watch." Human rights researchers seeking to understand abuses during Guatemala's bloody civil war have launched one of the largest detective projects in history. 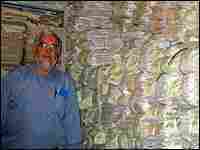 A mammoth warehouse discovered last year contains tens of millions of documents comprising the National Police Archive. The records, which the government first denied existed, are expected to offer evidence of a police role in murders and disappearances during Guatemala's "dirty war." "The dimension of the archive is truly gigantic," says Alberto Fuentes, assistant director of the project formally known as the Recuperation of the Historical Archive of the National Police. "They say there are 80 million pages of documents here," he says. "So in every possible space, in every alcove, there are just stacks and stacks and stacks of these police records." When the police archive was discovered last summer, it was in frightful condition. Rats, bats and cockroaches had made homes there. Rain blew in broken windows. Among one handful of file cards is a black-and-white police photo of a frightened young man. The record, dated Jan. 9, 1970, includes the man's name, address and fingerprints. It's labeled "subversive activities." "These people were killed," Fuentes says. "We have the information. One of the challenges is to find out what happened to these detainees." With millions of yellowed documents, human rights investigators will focus on the most savage years of the counter-insurgency. According to the Guatemalan truth commission, a majority of the estimated 200,000 war victims died between 1975 and 1985, mostly at the hands of state security forces. The Swiss government has donated $2 million to the project. The records warehouse is now supplied with copiers, digital scanners and computers. Seventy employees, wearing dust masks and tan lab coats, clean typewritten documents at long wooden tables. Mauricio Paniawa, curly-haired 26-year-old, says he took a job at the warehouse "to discover why they killed my father." "I passed the years of my youth always missing him, always wishing he was there," he says. "I want to know why they took him." The director of the National Police from 1978 to 1982 -- during the height of urban political violence -- was Gen. German Chupina Barahona. Last month, a Spanish National Court judge issued an international arrest warrant for torture, murder and illegal detention against Chupina and seven other former security officials. The charge is considered more symbolic than enforceable. 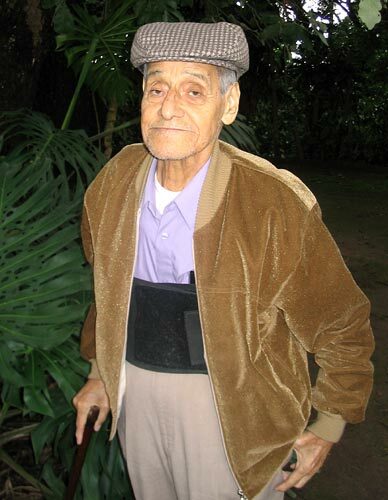 The general, now 85, lives in a walled residence south of Guatemala City. During an hour-long interview, he insisted he treated his prisoners humanely, and had very little to do with urban guerrillas in the first place. "I am here where you see me, and here I'll die," Chupina says. "I'm not interested in what happened in the past. But fortunately nothing grave happened on my watch. Nevertheless, if they find anything delicate, they should take me to court. But I'm sure that there's nothing there...."
One of the world's preeminent human rights data analysts, Patrick Ball, is working on the project. Ball, whose nonprofit company, Benetech, is located in Palo Alto, Calif., has worked with truth commissions in a dozen places, including El Salvador, Kosovo and Sierra Leone. "This is, by far, the largest single cache of documents that's been made available to a human rights process in history," Ball says. The archive's disorderly state makes the detective work difficult. Researchers have to burrow through masses of bureaucratic paperwork, including police pay stubs and invoices for new uniforms, before finding a picture of a bullet-riddled corpse. Human rights researchers have been reluctant to discuss their findings until they're ready to go public with compelling evidence of police misdeeds. But the government human rights ombudsman, Sergio Morales, who's overseeing the project, agreed to reveal one finding. "What I can tell you is... there are codes," he says. "We found documents coded by numbers. And we found the translation. Within these codes are the words 'kill,' 'abduct,' 'disappear.' Therefore, these are indicators of what there is." At the most, human rights workers hope to unearth specific crimes of the police, such as their involvement in the storming of the Spanish Embassy in 1980, in which 39 protesters were burned alive. At the least, it is hoped the archive will clear up unsolved murders. Morales says he hopes to be able to match fingerprints of police detainees with some 3,000 unidentified corpses that were fingerprinted at the city morgue before being interred in paupers' graves. Time is of the essence. The ombudsman's term expires in a year and a half. Researchers expect to make their first public revelations from the Guatemalan National Police Archive later this fall. Reporting on Guatemala's remarkable National Police Archive was a personal journey for John Burnett. In 1983, at age 27, he became the Guatemala correspondent for United Press International. For the next two years, when most of the world's attention was focused on wars in Nicaragua and El Salvador, he witnessed one of the bloodiest periods of Guatemala's armed conflict. The guerrillas and the government signed a peace accord in 1996, after which it was determined that an estimated 200,000 victims died in Guatemala's conflict -- more than the other two Central American wars combined. The two most tumultuous years of my life began on Aug. 8, 1983, when a pair of Cessna Dragonflies with the Guatemalan Air Force began buzzing the National Palace. Every radio station on the dial was playing the national anthem. It was my first day as the brand-new correspondent for UPI -- la upi, as it was known in Latin America. As it turned out, a faction of the army that was out of power was overthrowing the faction of the army that was in power. The golpistas, the topplers, turned their khaki military shirts inside out so as not to be confused with the soldiers defending the palace -- shirts versus skins, Guatemala-style. The coup d'etat was successful. Faces changed, but not the mission. Guatemala was in its 23rd year of trying to put down a guerrilla insurgency that sought to replace the right-wing, pro-U.S. government with a Marxist-oriented regime similar to the Sandinistas. The government's counterinsurgency strategy, which proved brutally effective, was to employ terror against the civilian population. Anyone suspected of being a guerrilla, a collaborator or a sympathizer was a potential target. The army conducted most of the anti-guerrilla campaigns, but the National Police were sometimes called in to help with urban operations in Guatemala City, where I lived. The police -- whose colossal archive is currently the focus of an intense human-rights investigation -- was headquartered in a castle-like building on Sexta Avenida. Gangly officers in ill-fitting uniforms were stationed in front of the fortress, hands resting on tassled white batons. They never pursued criminals, never ticketed. With dull eyes, they just stood there all day. The kidnappings and executions were, as a rule, extra-judicial and could happen anytime, anywhere. One night, I was walking out of my favorite steakhouse, El Rodeo, when I saw a Jeep Cherokee with tinted windows tearing down the deserted street. An early predecessor of the SUV, the Cherokee was said to be the favorite conveyance of death squads. From details I'd gleaned about past disappearances, I could imagine the hell in store for the bound, blindfolded detainee inside the speeding vehicle. Interrogators used traditional torture like beatings and electric shocks as well as more idiosyncratic methods: pumping chili sauce up the nose, immersing a face in toilet water to the point of drowning or spraying a plastic sack full of pesticides and placing it over the victim's head. The bodies were usually discovered in the morning dumped along roadsides or pitched into deep ravines called barrancas that surround the capitol. Fire fighters collected the corpses, which appeared in the most frightful conditions. Newspaper accounts of the day described a university professor with a bullet hole through his eye, a human rights advocate with his tongue torn out and a Christian Democrat with a wooden stake through his chest. Violent death was so routine that it lost its ability to shock and was often relegated to inside pages of the newspapers. A Guatemalan journalist friend of mine called these atrocities los muertocitos -- the little deaths. One particular morning, the killings struck home. A friend of mine, Peter Wolfe, a 27-year-old Peace Corps volunteer from Belmont, Mich., was found murdered on the street after leaving a party at my apartment. The homicide turned out to be random and apolitical. But because Peter and I looked uncannily alike there was briefly talk that his death was a case of mistaken identity. Deeply shaken, I visited an acquaintance with close contacts in the Guatemalan army and implored him to find out if I was on a death list. He walked into his bedroom, shut the door, made a phone call, returned, refilled my Scotch glass and said, “John, you're not on any list.” Later that night, after I had returned to my apartment, enormously relieved, the journalist in me emerged and thought, 'I wonder who maintains the official death list?'" I finally called it quits in Guatemala when I contracted typhoid and spent two weeks in the hospital being pumped full of antibiotics. On top of the tropical malady, the anxiety of covering Guatemala's civil war had become more than I wanted to handle. I moved to Atlanta with my fiancee and began stringing for National Public Radio. Returning to Guatemala this July to research the National Police archive, I was especially interested when Alberto Fuentes, an official with the Guatemalan Human Rights Ombudsman, led me into a musty room with a handprinted sign on the door that read, Mesa 1984 -- table 1984. Young employees were busy cleaning the documents from that year and organizing them in preparation for analysis. In coming months, researchers will pore over them for evidence of police involvement in the surveillance, disappearances and executions of the counterinsurgency. Fuentes didn't think I was kidding. He wrote my name on a Post-It note along with the name of the journalist who spied on me [he shall remain nameless in this essay]. Fuentes then stuck the note on the wall. “Let me know if you find anything,” he told the workers, and we continued the tour. I don't expect it will amount to anything, but it's reassuring to me that these human-rights detectives have dedicated themselves to unearthing what really happened in Guatemala City under cover of darkness during those terrible years. Parts of this column are adapted from John Burnett’s book, Uncivilized Beasts and Shameless Hellions: Travels With an NPR Correspondent, which will be published on Sept. 5.